The premises are located at the end bay of a building predominantly occupied by Ferroli UK Limited, which is built on a steel portal frame and steel trussed construction on a sealed concrete base with brick/concrete block and profile, steel, sheet clad infills. The latter extend to the pitched roof incorporating translucent lights part of which is underlined with secondary steel cladding. The height to the eaves is approximately 5.48 m.
There is a mezzanine office and storage facilities, a separate loading bay and a barrier controlled entrance to the site. Externally there is ample parking and servicing facilities. 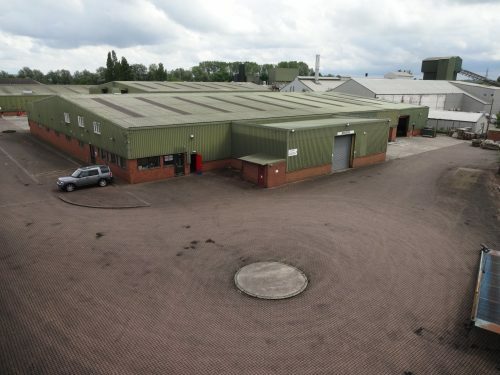 The premises extend to 32,205 sq ft. The unit is a secure site which benefits from an intercom accessed security barrier system and adjoining gatehouse. This is a two storey office accommodation with its own access. Ample parking to the side of the property and enough yard space for HGV’s to access.